God is alive and well in the deserts of New Mexico! Here is the report of what the Lord did last week in the “Harvest Festival” we conducted in Logan, New Mexico, as well as details about our project next week in the Philippines. With a population of approximately 900 people, the town of Logan had the seeds of the Gospel of Jesus Christ spread all over their community! Logan First Baptist Church, which has a Sunday church attendance of 120 people, prayed and prepared for several weeks for this event that happened October 16-19. A total of 33 people made a public decision for Jesus Christ, and out of those, 18 were first time salvation decisions! One was an 8-year-old boy, and when I asked him what his decision was, he said he accepted Jesus. I then asked him, “If you just accepted Jesus, then where is He right now?” He pointed to his left side and said, “Oh, Jesus is right here by my side…and He is in my heart too!” Their church has begun the follow-up of each person who made a life-changing decision for Christ! Next week, I leave for our next international mission! November 7-13, I will be in Manila, Philippines, a city of 12,000,000 people. We are conducting FIVE strategic Community Crusades throughout a targeted region of Manila. Our Philippine event director has trained 100 leaders, 20 from each area, for these events, and these leaders are ready for both pre-event personal evangelism and post-event follow-up of the people who turn to Christ! Plus, as extensions of these Community Crusades, I will be speaking in several public schools for DRUG AWARENESS PROGRAMS. Marijuana and “shabu,” which in the USA is called methamphetamine, are widely used by youth in Manila, and I will address the dangers of such drugs. What is different about some third-world countries, such as the Philippines, is that we are able to proclaim the GOOD NEWS OF JESUS CHRIST in the public schools! 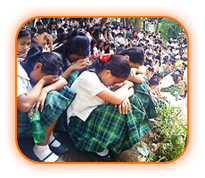 From 1993-2005, the Philippines held the Guinness Book of World Records for having the largest high school in the world! God willing, we will be sharing the Message of THE CROSS with between 10,000-20,000 students, of which 80% are not born-again Christians! This is an enormous open door to lead thousands of young people to Jesus Christ! 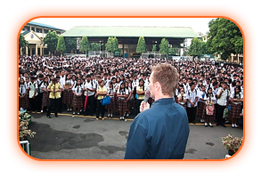 In the photo below, from Manila in 2012, I am speaking to 5,000 students, one-half of that school’s population. Then, in the photo above, students in Manila are responding to Jesus Christ through a personal prayer of repentance and faith! God willing, next week we will see many more young people turn to Christ—and you can help us reach them! You can help us to SAVE SOULS & CHANGE LIVES next week in the Philippines! Your gift designated to “Philippines Mission 2016” will help us to reach many families, and thousands of students, with the love of Jesus Christ! Plus, we are providing training & giving resources to the 100 church leaders mobilized for these events. You can give online with no credit card transaction fees at www.scottnute.org! And, you can give on your mobile by texting GIVE to 832-271-3353. Thank you for your help! This seemingly “insignificant” event was used by the Lord to stir new thoughts inside my mind and heart. I started asking myself questions like, “Have I become one of those weird people who do weird things and have weird quirks?” Such questions drew my mind to the past when I had encountered other people doing “weird” things that seemed strange but “harmless.” Such as, one person I knew vacuumed the carpet in their entire house almost every day. I found out this person couldn’t stand it when people walked on the carpet and left footprints. So, they vacuumed daily to get the carpet fibers all leaning in the same direction. Years later, at around the age of 27, I began “RECOVERY.” Meaning, I began to deal with my “weird” quirks, which were actually symptoms and “covers.” My “covers” were connected to emotional confusion, which was connected to depression and internal friction, which was connected to pain deep inside my heart and mind. In other words, the dots of my life journey to that point began to be connected and “uncovered.” When I began to ask myself these questions, and answered these questions with honesty, my mind seemed to quietly open up, and I began to understand myself, and others, and the world around me, better. As I look back, I now know that my Lord and Savior, Jesus Christ, began to reveal truth to me back then. As I moved out of denial about my issues and stopped “overspiritualizing” so many things, I realized, and understood, life on an entirely new level. 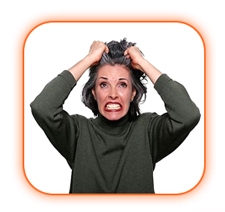 I realized the reason that person vacuumed the carpet every day had nothing to do with removing dirt, but rather it was a distraction they used in an attempt to deny, and not deal with, whatever deeper, unresolved issues they had inside. The same with my baseball teammate; his cap tapping and numerous daily showers were symptoms of something deeper going on inside of him. Do you mind if I ask you…are you trying to be perfect like I tried to be? Or, are you weird, and quirky, and imperfect like me? Or, maybe you haven’t really thought about such things before? Maybe today would be the day you can express the courage inside of you—through Jesus Christ—and begin to explore and dig a little bit…it could change your life. If I can be of help in any way, be sure and let me know. Our ministry is here to serve, and to help, and to love on, imperfect people!